At Tata Coffee, quality forms one of our most important core beliefs. We believe that the best kind of marketing we can do for ourselves is to give our customers the best quality products. Creating quality is a time-consuming consistent process that requires great attention to detail and immense patience. It is essential to take this journey because we are passionate about creating the best for our customers whether it is green bean or instant coffee. For us, the only way to achieve customer delight is through excellence in quality in all our products, processes and services. Since our customers come from all over the world, they have different requirements when it comes to cupping nuances, therefore we follow specific standards based on the grading system determined by the Coffee Board of India & Specialty Coffee Association. We have a standard procedure to ensure quality where all the steps involved in the production process is carefully monitored and sampling is done at every stage is done so that quality is assured. Creating quality starts with a deep understanding of what quality means to us as producers and delivering the expectation of quality both for ourselves and our customers. 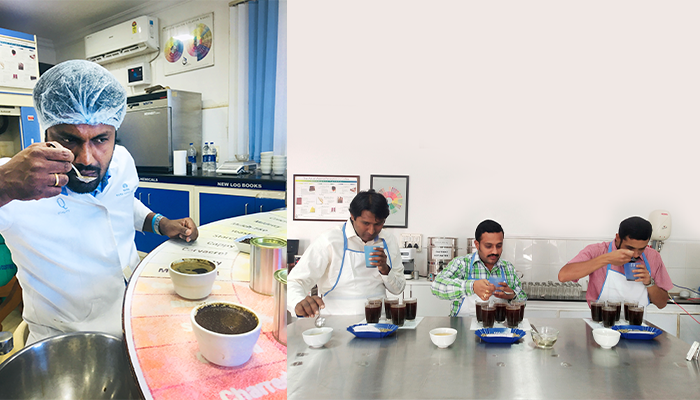 To get a better understanding of how quality is maintained right from the source, we got in conversation with Smaran Bheemaiah and Naveen who are Q-graders from Tata Coffee Green Bean Division. Smaran believes that this certification has taken his idea of cupping into a whole new level with a clearer perception about the nuances of a good coffee and the procedures and practices needed to get the best cup. Naveen expresses that, for him, getting to know coffee and its nuances is always going to be a learning process as this is a skill that comes with a great deal of experience and passion. All our 19 estates, spread across 8000 hectares of lush, green forest land, are Rainforest Alliance, SA8000 and UTZ certified. Our operations span the entire value chain, from growing the coffee in our own estates to processing them at our ISO certified dry mill in Coorg. Since quality starts right from the time it is grown, we are very mindful of each and every process involved in creating the best coffee beans. 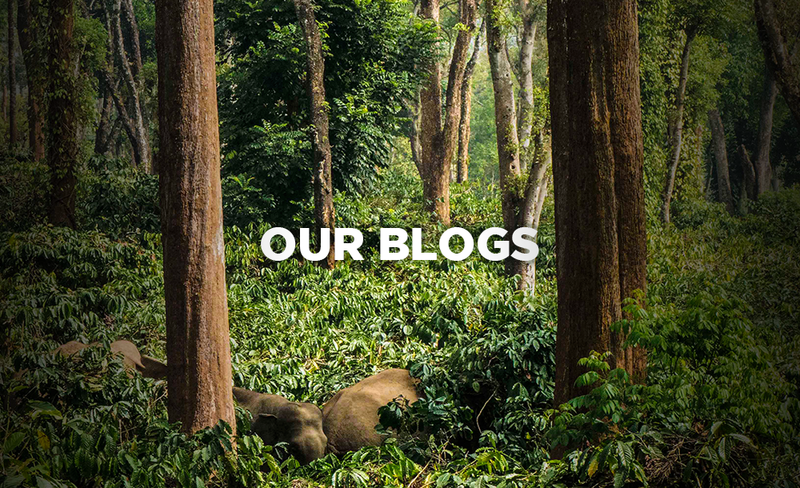 We hand-pick our coffees and delicately process them to bring about the intrinsic romance in every cup and since all our coffees are traceable, the customers also know exactly where their coffee comes from. Every step of the cultivation, harvest and processing is handled with an utmost emphasis on sustainability. After the coffee is processed, they are identified and separated according to their scores after which the hulling starts. The Quality Department decides the grades of the coffee based on the size of the bean as determined by standards maintained by the Coffee Board of India. If a batch does not meet the standard requirement then necessary corrective and preventive measures are put in place. After receiving the results of the cupped coffees, Smaran and Naveen make sure that the moisture content in the coffee is controlled – which is usually capped at 11%-12%. They also ensure that they reach out to the estate teams through a feedback form which talks about the important aspects of the coffee, defects and the causes of defect so that they can start taking combative measures for a better-quality produce for the next batch. For our Instant Coffee business, we use coffee beans from multiple origins to customize a variety of blends to suit the myriad tastes of our customers across the globe. Our portfolio includes Freeze Dried coffees, Spray Dried coffees, Agglomerated coffees and Coffee Mixes. Customised packaging and supply chain solutions enable us to offer enhanced value to our customers. We have implemented best practices across all operational aspects at our Instant Coffee division and the facilities are certified according to internationally recognized standards. Renewable energy forms about 75% of our energy consumption at the facilities. To understand how quality is kept in check in our Instant Coffee division, we got in touch with Sanjith PD, Quality Control, Tata Coffee Instant Coffee Division who was also very excited to share how he won an award recently at a cupping competition in Barcelona. According to Sanjith, Tata Coffee’s products are based on customer triggers and delivered as per their expectation through extensive research and communication to understand their requirements. Communication is the foundation of a strong relationship and at Tata Coffee, we believe that understanding what the customer really wants is the key to building trust and loyalty. We also offer our customers to co-create blends with us because at the end of the day, what we wish for is to give exactly what they want. This has not only allowed a mutual learning and respect between our customers and us as an organization but also laid a robust ground for long term partnerships. Sanjith goes on to say that the most important skill required to maintain excellent quality in the process is to always be vigilant and on the lookout for even the tiniest of flaws and although it is not a simple task to create a great cup of coffee, he says that it is every sip of the experience that makes his job at Tata Coffee worthwhile. He recalls a very appreciative communication from a customer, who remarked that Tata Coffee’s excellent efforts helped him gain major market share in his geography. To sum it all up, one could say that when it comes to quality, we are very uncompromising and undaunting because we believe in the best, both for us and for our customers. We don’t just talk quality, we wholly embrace it. It is a part of who we are. It is our love for the exotic flavors, enticing aroma, luxurious bodies and delighting customers all over the world that keeps us going - it is what we live for.